During Microsoft Ignite 2017, Microsoft announced to phase out Skype For Business Online and merge it with MS Teams. The road-map for this implementation has now completed. Skype for Business Online is now part of MS Teams officially as from October 1, 2018 – MS Teams is the primary client for messaging, meeting and client services. Talking about the history Skype, we look from Lync to Skype for Business and then the merger within the MS Teams platform. 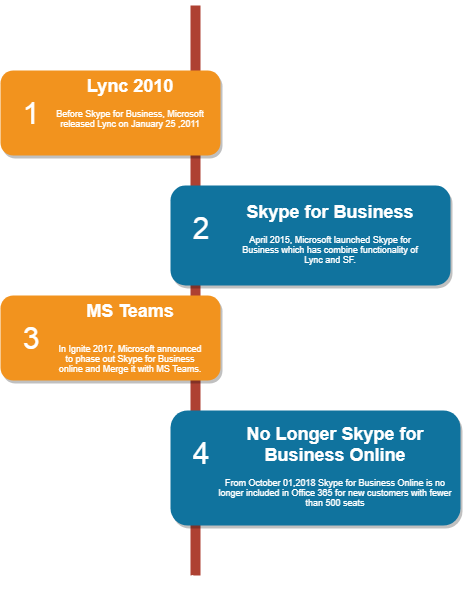 During 2011, when businesses needed collaboration, they used the product Lync for business communications. After Lync in 2015 had ended, Microsoft planned to combine the functionality of Lync with Skype For Business (SFB) and as a result Microsoft launched the product in April 2015. When businesses needed collaboration, the primary solution and industry standard quickly became SFB. However, SFB has always been compared with the MS Teams for its features and functionality. For the businesses who were already using SFB, MS Teams provided a new level of modern functionality and flexibility. Microsoft then went on to no longer include SFB in Office 365 for new customers with fewer than 500 licenses. From SFB only Instant Messaging and Sending files was initially possible. However, with the use of MS Teams, threaded and persistent chat with add-on apps became possible. Teams also facilitated better document management within the application. Digital work spaces could become central, and managed easily. Businesses utilise mobile and other devices to connect with the employees and clients so MS Teams provided flexibility of its functionality via their own mobile application for iOS, Android and Microsoft enabled smart phones. MS Teams was built with enterprise-level security from Office 365, so access to any device without the concern of unsecured conversation was upheld by the secure Microsoft platforms. MS Teams encrypts all data, at all times, at rest and in transit, with multi-factor authentication to protect users’ identities. How Cielo Costa Help you to move from Skype for Business Online to MS Teams? Cielo Costa have highly qualified experts, advisors, architects and developers for MS Teams. Cielo Costa will be able to suggest a suitable approach to move from Skype For Business to MS Teams or develop other Office 365 platform solution for business. Please use the Get In Touch page to send through an inquiry for further information or assistance.